Over the last decade, improvements in dental implants have revolutionized dentistry. The fascinating improvement in the field has resulted in the dental implants process offering highly predictable results. However, even with all these improvements, there could be some cases where there are some limitations and two most common ones being the lack of considerable bone to support and need for additional surgical procedures like sinus lift. Also the cost, the number of visits and time taken for these surgical procedures is also to be considered. Recently we had an International patient who had already consulted many dentists regarding dental implants. When we asked her about her problem, she started explaining in detail. Initially, ten years back she used to have a very good dentition. 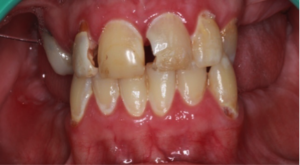 Later she developed little gum infection and decayed teeth which progressively increased over time leading to complete loss of upper and lower back teeth five years back. She was advised to go with dental implants by many dentists but for the upper back teeth, an additional surgical procedure of sinus lift was also advised in her home country as well as in India. Finally, we understood that she wishes to get an immediate, fixed permanent solution for her missing teeth in a simple way and she doesn’t want to go with additional surgical procedures i.e. 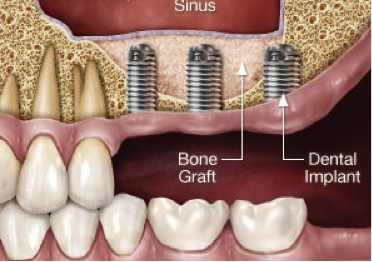 Sinus Lifting and Bone Grafting. For patients like her and others, we thought it would be good to write this blog on Sinus lift/bone augmentation and the alternatives to sinus lift method. Lowering of sinus membrane showing lack of enough bone support for the implant. Sinus is actually an air-filled empty space in the skull bone. There are various sinus spaces in the skull bone. The cheekbone which is present immediately above upper back teeth holds an empty space(sinus) in it which is known as the maxillary sinus. 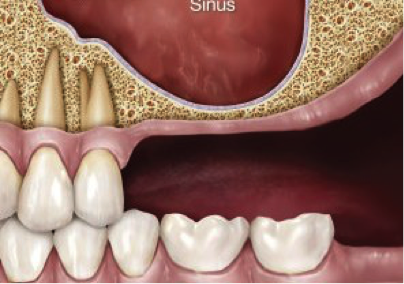 Usually, there are two pyramidal maxillary sinuses located above the upper back teeth and besides nose. This is an air-filled empty space with a pink soft tissue lining known as sinus membrane. Due to this position above the upper back teeth, it has a significant role in dental implant placement, especially in the upper back teeth region. The dental implant shouldn’t hinder these sinuses as these have very important functions like reducing skull weight, moisturizing the air and also affects tone quality in speech. What is sinus lift and why is it done? A sinus lifting procedure is done when the floor of the sinus is too close to the site where the implants are to be placed. Why does the floor of the sinus get lowered? Periodontal disease i.e. severe gum disease. What exactly are the sinus lift and bone grafting procedure? In this procedure, the sinus membrane is elevated and space is created between membrane and bone. Into this space, an artificial bone graft is placed to the required thickness for the future dental implant and closed back. The patient will be asked to wait for 6 to 8 months for the bone graft to get integrated into the adjacent bone. Later a dental implant will be placed. Some dentists might place a dental implant and bone graft in the same visit in order to avoid a second surgical procedure. TTPHIL ALL TILT procedure invented by Dr.Venkat Ratna Nag is a great alternative to dental implants with sinus lift. 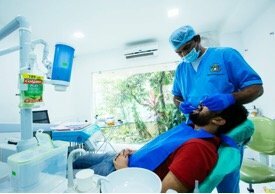 Considering patients who cannot afford invasive procedures like Sinus lift, who are medically compromised and can’t support such surgical procedures, Dr. Venkat Ratna Nag has come out with an innovative process of dental implantation to avoid sinus lifting type of surgical interventions. Our main motto is to streamline the time, cost and number of appointments taken for a successful implantation procedure. 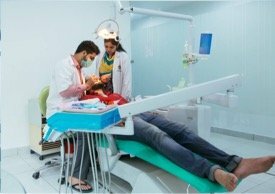 Here at The Dental Specialists, India, we place implants with TTPHIL ALL TILT technique to bypass sinus and we are proud to say that we can give permanent fixed teeth just in two days ( in ideal condition) whereas in the traditional method it will take minimum 6-12 months to give permanent teeth. We take utmost care of the patient to restore his/he lost smile with minimal bleeding, pain, discomfort and postoperative care using this latest technology. Wondering how it is possible? Yes! There are definitive alternative treatments to sinus lifts with the help of bi-cortical anchorage. Here we take anchorage from the basal bone with a two-piece cortical implant, which is strong, resistant to regular wear and tear and can bear chewing forces very effectively without any failures. A combination of zygomatic and pterygoid implants are preferable for bypassing the sinus chamber. Immediate loading can be done without any hesitation as it attains its support from basal bone whereas in regular implant procedures permanent teeth fixation is done only after three to six months. TTPHIL ALL TILT is a gold standard technique which gives glow to your smile with minimal intervention. How it is different from traditional technique? IL-Immediate Loading: Immediate loading i.e. teeth can be given within 48 hours, with CAD /CAM as it is getting its support from the basal bone which is strong and resistant. Replacing 14 -16 PERMANENT FIXED TEETH per jaw using only six implants in 48 hours(in ideal conditions) with the aid of advanced CAD/CAM technology is our speciality at The Dental Specialists, India. The dedicated team of dentists at TDS take intimate, special care of apprehensive, medically compromised patients. The entire process of teeth replacement will be done in seven to nine days giving enough time for them to adjust to these procedures. The set 14 -16 teeth are replaced using only six implants per jaw in ideal full mouth edentulous conditions. The first step would be for Dr.Venkat Ratna Nag to assess both clinically and radiographically and surgical guides are prepared using CBCT data on the same day. 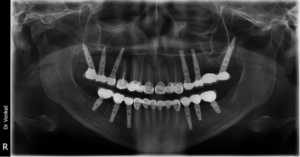 Later the tall and tilted implants are placed using pinhole, flapless surgery using TTPHIL ALL TILT technique, which is exclusively done by Dr. Venkat Ratna Nag @ The Dental Specialists, India. As we are taking bicortical anchorage immediate loading is possible. In case of apprehensive patients, temporary teeth are given on the same day. By using these temporary teeth patient will get accustomed to the new set of dentition and check for any further corrections. Also, it prevents opening up of spaces in between permanent teeth and gum line as we are giving ample time for gums to heal. Later within 7 to 9 days the permanent set of teeth are fabricated and fixed. The excellent team of doctors headed by Dr.Venkat have been successfully practising this TTPHIL ALL TILT technique for years and delivered hundreds of beautiful smile to clients all over the world. The team at The Dental Specialists are a team of 70 highly experienced medical staff including specialist doctors across all branches of dentistry and super specialization around dental implants. All our departments are in-house, including highly equipped labs with best in class equipment. We also have a strong team of non-clinical staff to provide comprehensive support to all our patients across the entire process. The Dental Specialists has once again been selected as one of the top three dental clinics in Hyderabad by Three Best Rated ® (U.S.) @threebestrated.Three Best Rated rates doctors and Dental Hospitals based on a rigorous 50 point inspection list.